HELP! I’M A CCP WITH A CRUSH ON A DORK!! I’m a CCP, and I have this HUGE crush on a dorky guy. My friends are really mean to him and like to gossip about him. So, when they came to my house for a sleepover and we each admitted our crushes, I passed. But they overheard me telling my dog that I like him. Now, not only do they think I’m lame, dorky and a weirdo, but they also think I’m a lunatic! How do I get my BFFs back? Okay, um…first, can we talk about how you confessed your crush to your dog?! I LOVE that! I tell my dog Daisy ALLLLL my secrets. Dogs are the best. They don’t care who you’re crushing on or if you have a giant zit in the middle of your forehead or ANYTHING. But I’m sorry your friends overheard what you told your awesome dog, and I’m even sorrier that you didn’t feel like you could tell them in the first place. I mean, you SHOULD be able to tell your friends who you’re crushing on! 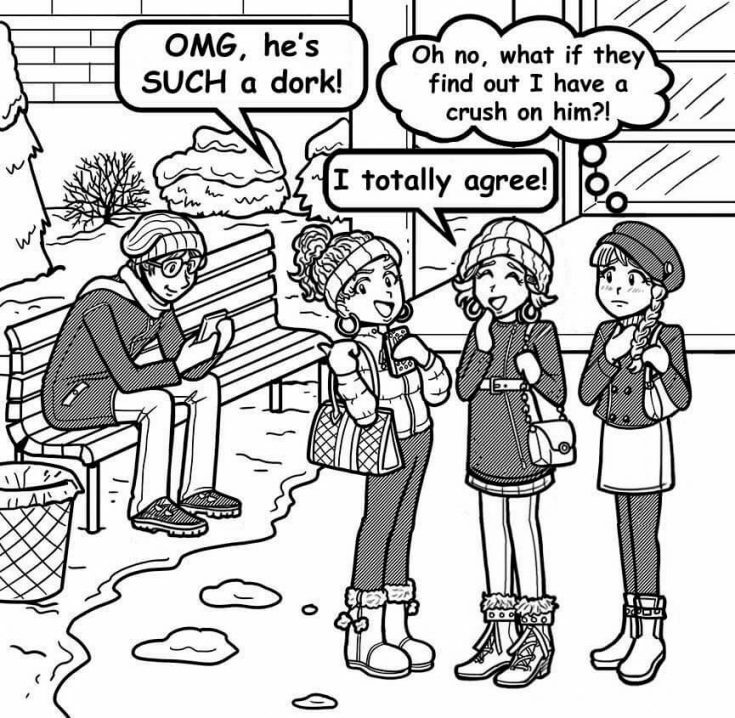 Personally, I think it’s great that you’re crushing on a dork! That tells me you like him for who he is, not his rep for being a CCP. Your friends don’t have to like him, but they DO have to accept you, no matter who you like. Otherwise, they’re not really friends! I find myself saying this A LOT to my friends, but that’s because it’s true. I get SO many letters from people who think they have to accept so-called friends who treat them horribly! NO WAY 🙁 ! Demand more from your friends because you deserve better. And they deserve to learn to be better friends! I’m not saying you have to slam the door in your friends’ faces over this crush. Because we’re always learning and they deserve a second chance if they’re willing to learn. But, I also think you shouldn’t pretend to be something you’re not or pretend you don’t have a dorky crush just to win them back. This is one of those situations where your confidence matters a LOT. If you go to them all ashamed and apologetic like you’ve done something wrong, they have the power and they don’t deserve it. If you go to them confident of who you are and your right to like who you like, then YOU have the power. And hopefully they’ll realize how ridiculous and unfair they’re being. Have you ever crushed on someone who was different from you? Tell us about it in the comments! You should just leave them alone and when they are ready to talk they will talk. i have a crush on someone who is in the year above me?! I think it’s cool that you’re crushing on someone who’s ‘less popular,’ because I don’t really see the big deal about popularity. No,no,no. Follow your heart. If your not sure which it seems that way then your crush. Popularity is important. Good luck girl! I LOVE dork diaries! and NIKKI,don’t care what other people say,BE YOURSELF!!!!!!!! !